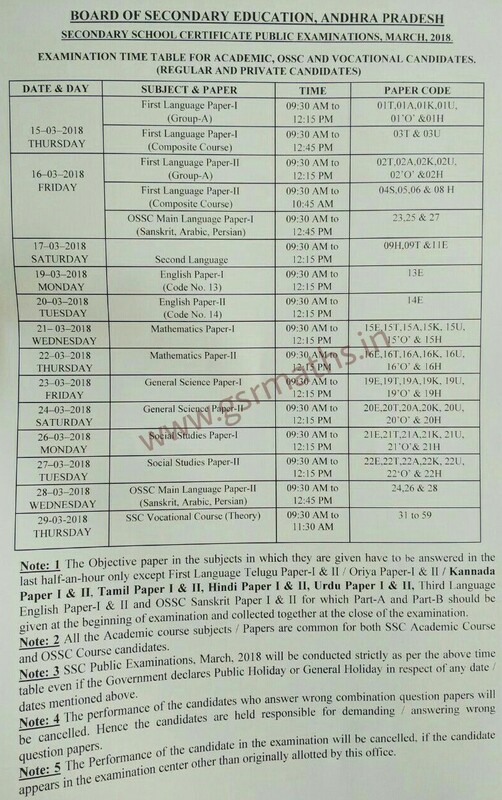 The Objective paper in the subjects in which they are given have to be answered in the last half-an-hour only except First Language Telugu Paper-I & 11 / Oriya Paper-1 & 11 / Kannada Paper I & II, Tamil Paper I & II, Hindi Paper I & II, Urdu Paper I & II, Third Language English Paper-I & II and OSSC Sanskrit Paper I & II for which Part-A and Part-B should be given at the beginning of examination and collected together at the close of the examination. 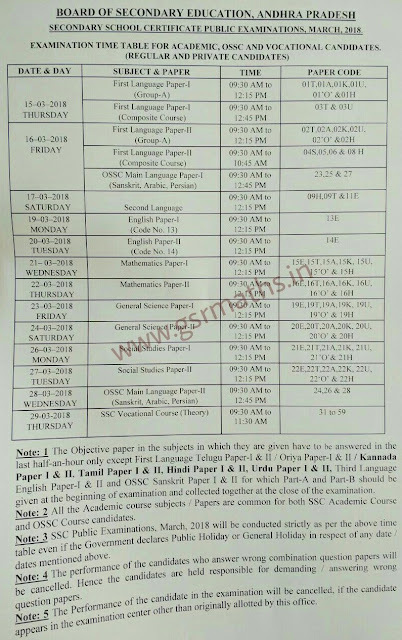 SSC Public Examinations, March, 2018 will be conducted strictly as per the above time table even if the Government declares Public Holiday or General Holiday in respect of any date / dates mentioned above. The Performance of the candidates who answer wrong combination question papers will be cancelled. Hence the candidates are held responsible for demanding / answering wrong Question Papers. The Performance of the candidate in the examination will be cancelled. If the candidate appears in he examination center other than originally allotted by this office.